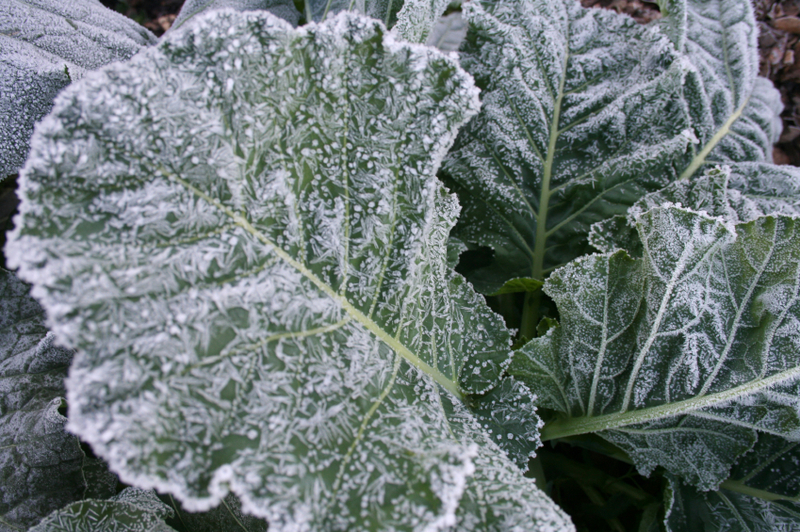 Frost-covered collard greens, a cold-loving leafy vegetable. Photo courtesy of Bonnie Plants. Edible garden plants that defy Lady Autumn and Old Man Winter. Conventional wisdom says that late fall and early winter mostly spells the end of gardening in Zones 1 through 7, but there are cold-hardy edibles that stand up to and even thrive in the harsh climates—with and without help from greenhouses, row covers, cold frames, hoop houses or movable containers. So which ones can take the chill? Try mustard and collard greens, kale, lettuce, spinach, cabbage, chard, carrots, onions, parsley, broccoli, cauliflower, radish, peas, brussel sprouts, basil, thyme, chives and mint. Some varieties of these tough veggies and herbs don’t mind being planted after the frost or even in frozen ground, and most will be ready for harvest well before you even think about starting your spring garden. This entry was posted in Fall Gardening, Fall Gardens, winter garden, winter gardening and tagged Cold Climate Gardening, cold hardy, cold tolerang, fall garden, fall gardening, herbs, Kathy Purdy, Lewis Hill, Niki Jabbour, vegetables, winter garden, winter gardening. Bookmark the permalink. Thank you for including me as a resource. To make it easier for your readers, here’s a link to the Vegetable Archives on my website. So far my Red and Southern mustards, 5-colored Chard and Red Russian Kale are all loving it after the first frosts here in Seattle. I’m waiting for them to turn the Kale sweet again. It’s so wonderful to have fresh greens from your garden in November and later. But basil will never grow outdoors here in winter. It’s too cold.